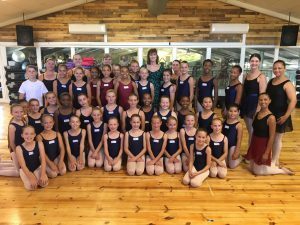 On Saturday the 22nd of April, the RAD Eastern Cape Panel held a grades workshop for all the Grade 1 to Grade 3 ballet pupils to prepare them for their exams. Here is a photo of the huge Grade 3 Class. This entry was posted in Studio Happenings on April 24, 2017 by admin. Well done to Carrie and the seniors from Jeffreys Bay for putting on a very successful production at the Nico Malan Inikollig Arts Festival. The girls danced twice a day on the 27th and 28th of March and were a popular must-see show choice. 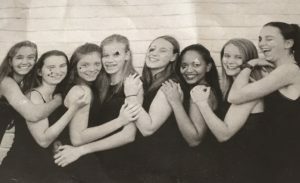 The production was called Controlled Chaos and was a dance adaptation depicting the masks and struggles of mental uncertainty. The twenty-minute piece focusing on mental illnesses such as depression and anxiety and general teenage mental disorders while maintaining a preface of calm and control. This is to lightly explore the hidden struggles that are not always apparent but hidden under masks and uncertainty. This is to lightly explore the hidden struggles that are not always apparent but hidden under masks and uncertainty. This entry was posted in Studio Happenings and tagged Controlled Chaos Production on April 10, 2017 by admin.